Pain is where the problem is… or not! In terms of pain the general belief is: where the pain is, is where the weakness is. And you would be right in most cases. The same thoughts relate to back pain. 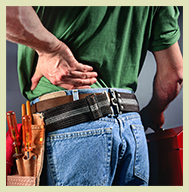 Have you ever wondered why one side of your lower back is hurting and the other side is fine? Is this due to the painful side being weak and the other side strong? It is possible that actually the opposite happening. Your pain-free side is the trouble maker and the painful side is actually doing all the work (and shouldn’t be blamed at all). Imagine two people carrying a heavy log. One decides not to do the work and rest, the one left carrying takes the full load. At the end of the day, the carrier has got a sore back and the slacker is fine. The same thing can happen to you. One side of your body is actually weaker and doesn’t do the job properly while the other side is the stronger one. Your body (not stupid) decides to put the strong side in charge of the two jobs by shifting your weight towards the strong side. This overload of work brings too much strain and the resultant pain/inflammation occurs. Think about it next time you are cursing at the wrong side of your back. If you are suffering from back pain, we assess the cause in order to treat the problem – please call our clinic on 95328001 to make an appointment.